Formerly known as Morgan's Cove Resort!!. We Introduce Beach Break Resort a new experience for our customers. Costa Rica's number one tropical beach destination . Located between the warm sands of the Pacific Ocean and lush rain forests mountains this resort ,the closest beach community to San Jose International airport (SJO), offers all of Costa Rica’s main attractions,zip lining,river rafting, surfing & sport fishing just to name a few. 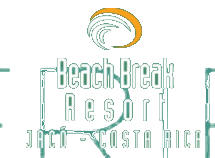 Beach Break Resort is your best choice for Eco and adventure tourism in Costa Rica. Stroll around 5 acres of tropical gardens with exotic birds & animals, plunge into your choice of outdoor pools and relax with a cocktail from the poolside bar.